This is the newest, high-definition macula scanner on the market (see below).The Zeiss Cirrus HD-OCT, is a non-invasive technology used for imaging the retina - the multi-layered sensory tissue lining the back of the eye. The Optical Coherence Tomography (OCT) scanner was the first instrument to allow doctors to see cross-sectional images of the retina. 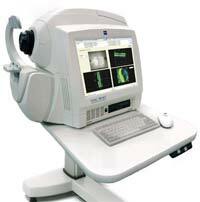 This technology has been used in vitreo-retinal clinics for some years. However, the latest much higher-definition scanning technology has revolutionized the way we image and diagnose macula conditions such as differentiating dry macula degeneration from wet macula degeneration, assessing macula holes, macular epiretinal membranes and other macula retinal pathology. The Optical Coherence Tomography (OCT) scanner also is used to visualise the anterior chamber angle structures that can be affected in Narrow Angle Glaucoma, Plateau Iris Glaucoma and Pigment Dispersion Glaucoma, among other conditions. The Optical Coherence Tomography (OCT) scanner is further used in assessing the thickness of the Retinal Nerve Fibre Layer adjacent to the Optic Disc (Optic Nerve Head). In Glaucoma and some other conditions, the nerve fibres leaving the eye via the optic nerve head die off and thus assessing the thickness of this nerve fibre layer can often show the early signs of glaucoma before the damage can be demonstrated by more convential methods such as Visual field Testing. Also used in Glaucoma assessment we utilise the Optical Coherence Tomography (OCT) scanner to measure the Centre Corneal Thickness, which gives us a measurement which relates to corneal rigidity or stiffness. Central corneal thickness can affect the readings optometrists and ophthalmologists obtain by tonometry (intra-ocular pressure (IOP) measurement), because a thick and stiffer cornea will give an artificially elevated intra-ocular pressure (IOP) reading. Conversely, a thin and less rigid cornea will produce a reading that is actually lower than the true pressure. Glaucoma may thus go undetected in people with thin a cornea or might be misdiagnosed in people with a thicker cornea. In addition, having a thin cornea is an independant risk factor for Glaucoma as it may mean that the Optic Nerve Head is more vunerable to Glaucoma damage. With its advanced, next generation, precise algorithms, The Zeiss Cirrus HD-OCT provides Matheson Optometrists with highly detailed, high-definition maps and images of the macula and retinal structures. This allows us to make the most accurate diagnosis possible. Optical Coherence Tomography (OCT) essentially works by measuring the time delay and intensity of an optical signal that is sent into the eye, as it is reflected back from the structures at the back of the eye in a similar way that an ultrasound signal shows the structure of internal organs etc deep within our bodies. Optical Coherence Tomography (OCT) however, provides an image of much higher resolution than an ultrasound scan, MRI or CT xray scans. Optical Coherence Tomography (OCT) began development in 1991, but the Zeiss Cirrus Optical Coherence Tomography (OCT) High Definition scanner we have today is many times better in numerous ways than its predesessors. Optical Coherence Tomography (OCT) is also used in other fields such as in the cardio-vascular field, where it often shows the ealiest signs of arterial blockages, or plaques which can cause stokes etc. Optical Coherence Tomography (OCT) is very powerful as it allows real-time "optical biopsy" of the tissues for both diagnosis and to guide treatrment. OCT is currently being used in delicate ophthalmic micro surgeries, to obtain a "live view" and instant Corneal measurement in procedures such as transplanting a specific layer within the cornea, called DSEK .